You can find a location close to you by clicking here. According to the Arthritis Foundation website, “Massage Envy and the Arthritis Foundation are joining forces for the second annual Healing Hands for Arthritis, a one‐day national event to build awareness and raise funds to fight arthritis. On September 19, 2012, Massage Envy clinics nationwide will donate $10 from every one‐hour massage or facial to the Arthritis Foundation. Murad®, Massage Envy’s exclusive skin care partner, and Wyndmere also will donate 10 percent of all sales of skincare products sold at Massage Envy Spa locations during the event to the Arthritis Foundation. Massage Envy and the Arthritis Foundation share a common understanding about the devastating effects of arthritis on the body and the potential for massage therapy to relieve and control certain symptoms. Message therapy can play an important role in alleviating the pain and swelling caused by arthritis, improving flexibility and circulation and reducing stress and anxiety. Proceeds from the Healing Hands for Arthritis event will support the Arthritis Foundation’s efforts to fund life-changing research; fight for health care policies that could improve the lives of millions; partner with families to provide empowering programs and information; and ultimately, find a cure. To learn more about the benefits of massage for arthritis, click here. You can also check out this article about things to know about arthritis and massage before booking your appointment. And – how about this awesome option for the ladies: make it a Girls’ Night Out! Fighting arthritis by getting a relaxing massage or facial with your girlfriends is the perfect reason to treat yourselves to a night — or day! — out! Yes, that’s right – plan a girl’s night out that makes a difference! Join us on September 19, 2012 to make an impact and bring hope and healing to the millions affected by the nation’s leading cause of disability. Contact the women you know – family, friends and coworkers, invite them to join you and then do something for yourself while doing something for others. Once you’ve made your own group plans, help spread the word on email, Facebook and Twitter (#HealingHands). Why not have brunch or lunch before your massages and facials? Or, grab dinner, drinks, or coffee after you’re done pampering yourselves for a cause? It’s a win-win! 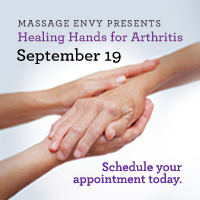 We hope that you’ll join Massage Envy and the Arthritis Foundation on September 19th for Healing Hands for Arthritis. Here are some ways to spread the word and plan a Healing Hands for Arthritis event near you! What’s YOUR weapon against arthritis? Follow the Arthritis Foundation, Mid Atlantic Region on Twitter @MidAtlanticAF! Follow us on Pinterest, here! “Like” us on Facebook here! Let’s all unite against arthritis. Together, we will achieve the vision of a world free from arthritis pain. Tags: #HealingHands, advocacy, Arthritis Ashley, Arthritis Blog, Arthritis Foundation, Ashley Boynes-Shuck, Awareness, Facial, fighting arthritis, fundraiser, Girls Night Out, Healing Hands for Arthritis, Health, HH4A, Human Body, Massage, Massage Envy, Massage Envy Arthritis Foundation, Massage Envy Healing Hands for Arthritis, Massage Envy Locations, massage for arthritis, Mid Atlantic AF, Mid Atlantic Region, OA, Osteoarthritis, RA, Rheum, Rheumatoid Arthritis, rheumatology, September 2012, Spa, types of arthritis, Wellness. Bookmark the permalink.